To produce a victory.Some came back; some didn’t. Let’s say “thank you” to every wearer. CAMP PENDLETON, Calif. — Navy Secretary Ray Mabus honored a Worcester, Mass., man and three other members of a Marine special operations team Monday in a rare public ceremony for those who have served in the covert forces. Worcester the Navy Cross, the Navy’s highest honor and the military’s second-highest honor, for tending to the wounded while guiding the platoon to safety during an ­attack in Helmand Province in Afghanistan in July 2010 that spanned two days. Three others on his team, includ­ing a Navy corpsman, were given Silver Stars. Often the heroic actions of those on special operations teams are known only to each other and the leadership because of their covert work on classified missions. ‘‘This is a chance to recognize people who don’t get recognized much,’’ Mabus said. Soutra was a canine handler with a Marine special operations team when they were ambushed. After the team’s assistant leader was fatally wounded by an enemy explosive during the ambush, Soutra jumped ­into action, repeatedly running into the line of fire as he helped ­direct troops to defend themselves and fight off the enemy, Mabus said. At one point, the 27-year-old Marine placed a tourniquet on a wounded commando, before dragging him to a ditch for cover. He worked tirelessly for more than an hour after the initial blast and helped carry casualties through the sporadic gunfire, officials said. His military dog stayed attached to his side during the ­ordeal. The dog had to be put down more than a year ago ­because it had cancer. Major James Rose, Staff Sergeant Frankie Shinost Jr., and Navy Corpsman Patrick Quill received Silver Stars for their actions that day. The four men called it a horrible day because they lost their element leader, Staff Sergeant Chris Antonik. ‘‘Every day I think about Chris,’’ said Soutra, calling him a close friend and great warrior. Soutra vowed to try to carry on as the kind of warrior who would make Antonik proud. The USO Wishbook is an alternative giving catalog. The gifts you purchase from the USO Wishbook allow you to recognize a special occasion while directly benefiting troops and their families. Click here to support our Troops this Holiday Season, or click the graphics above or below. (secure site). 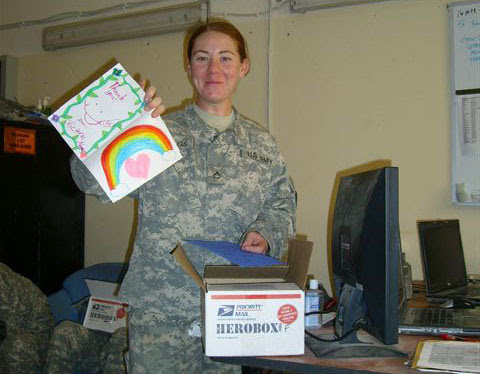 HeroBox is a 501(c)(3) non-profit organization that supports deployed American service members by providing the physical and moral support our heroes need while they are away from home. We are able to achieve this mission through programs that are designed to engage America’s greatest resource, the people. In 2007, Specialist Evan Housley was deployed to Taji, Iraq with the 25th ID. Early in his deployment, Evan noticed that a lot of service members were not receiving any support from home. He also realized that deployed service members have specific needs depending on their gender, location and a variety of other factors. The typical care packages are generic and don’t always provide the items our heroes need. Evan discussed this with his brother Ryan and together they developed a web platform that connected the American people with their heroes instantly online. Thus giving service members the ability to request specific items and providing Americans with a way to directly support the troops. HeroBox.org was launched in May 2008 to support the brothers’ vision. HeroBox now has sponsors and volunteers in every state who help support thousands of American heroes annually. Visit HeroBox by clicking here or on any of the graphics. Please visit www.amillionthanks.org or click any one of the graphics on this page.